The Mix’n Matches Trio is one of the premier musical groups in the Nacogdoches-Lufkin area. From Blues, Straight Ahead Jazz, Latin, to other popular music such as Van Morrison, and Al Green the music of the Mix and Matches guarantees a great time for any occasion from a small-medium venue to a wedding reception or banquet function. Each member of the group is an experienced professional with performances covering the United States, Europe and Asia including collaborations with some of the most well known musicians around the world such as Bobby Shew, Jiggs Wigham, Wycliff Gordon, and Marvin Stamm. 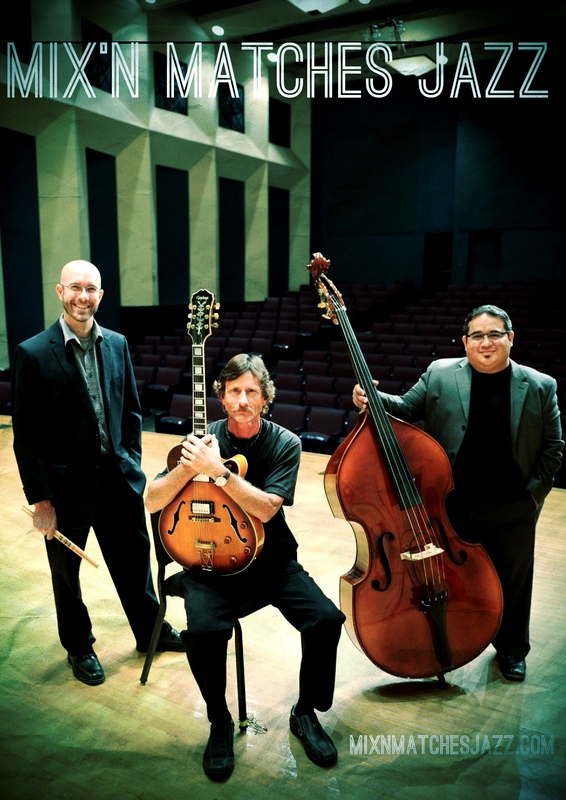 The Mix’n Matches Trio performs regularly at the Liberty Bell Bar for their “Evening Jazz” and “Jazz Brunch” series. They can also be found performing in venues all over the East Texas. Keep up the Mix’n Matches through Facebook at facebook.com/Mixnmatchesjazz. For Booking information please contact us through email via mixnmatchesjazz@gmail.com or in the “Contact Us” section of this website.